I'm sure that many of you are familiar with Duck Hunt on NES, but I doubt that many have seen Ultimate Duck Hunting on Wii. Apart from the subject matter, it has no relation to the NES game and it was developed by some people you've probably never heard of. I'll admit that I'm not terribly familiar with hunting games, but as a critic of games in general, I can confidently say that Ultimate Duck Hunting is pretty darn bad. Right from the start, you'll notice that the presentation is lacking; there's no widescreen support, the graphics are poor even by the previous generation's standards, and the menu text's font looks like it was never changed from the default. The game tries to distract you from the ugly visuals with real pictures of dogs and scenery on the menu backgrounds, but don't be deceived! No matter which of the handful of locations you choose to hunt at, you'll be met with a depressingly drab and muddy environment. As for the gameplay, before you can begin, you have to train your dog to obey your commands. This is basically just a tutorial for how to get your dog to retrieve the ducks. The controls sometimes work well enough, but I had a lot of trouble getting my dog to go out to the duck instead of coming back to me. Even when the controls do work, depending on your dog's stats, it might take a bit for it to respond. Then, even when the dog responds, it's likely to run right past a fallen duck without seeing it. But the chances are high that you won't have that problem because you're unlikely to ever shoot a duck in the first place. 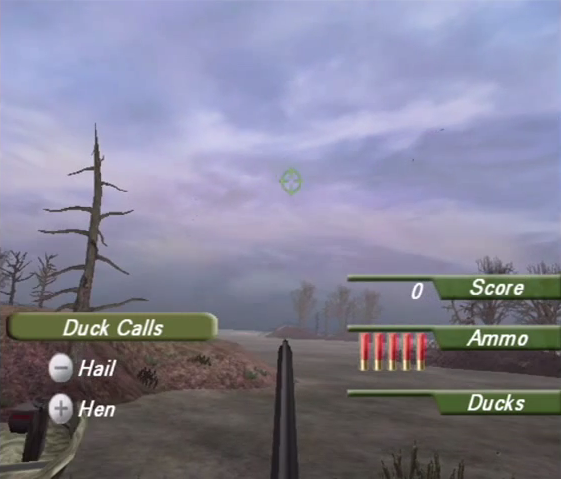 Even with the option of a few different guns and camo, two duck calls, and five, ten, or fifteen decoys, nothing appears to influence whether the ducks come within range. The majority of your time will be spent standing on a small bit of land and watching longingly as flocks of ducks fly in the distance. If you try to shoot them, they'll fly away. If you don't shoot them, they'll fly away. Very occasionally, one will fly directly overhead, but it'll be too late for you to react and shoot it. 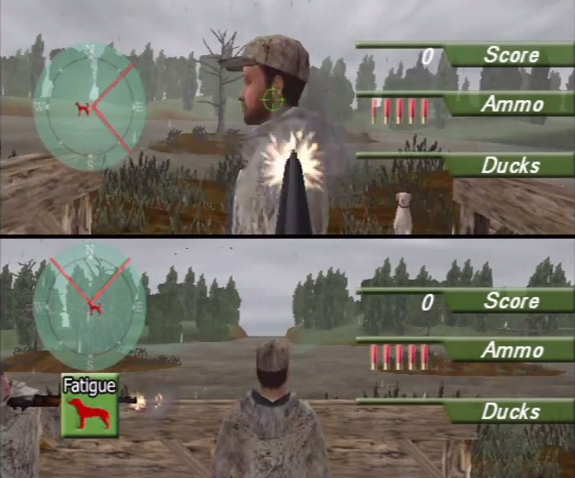 You'd think that shooting would work well with a Wii remote, but this game manages to screw it up. You do point and shoot with the Wii remote, but you have to turn the field of view with the nunchuck's joystick. That in itself isn't so bad, except that there are no options for adjusting the sensitivity or inverting the y-axis. If you do manage to shoot a duck and retrieve it, you get some seemingly arbitrary points and then the hunt is abruptly over. You're then free to move on to do the exact same thing at a different location which differs only in appearance. If you and a friend want to be bored together, you can try out the splitscreen multiplayer option. Cool, I guess. Finally, the most important thing that everyone who played the NES Duck Hunt will want to know is whether or not you can shoot the dog. Well, you can't. It'll just sit there unflinchingly and let out a whine. Similarly, shooting your friend in multiplayer mode does not trigger any animation on their part, but simply a "Yow!". If you're looking for the quintessential hunting game experience, I don't know what to recommend, but there surely must be something better out there than Ultimate Duck Hunting.